Under the guidance of our Chef Manager we encourage pupils and students to eat healthily and we offer nutritious, enjoyable and tasty food at a very reasonable price. 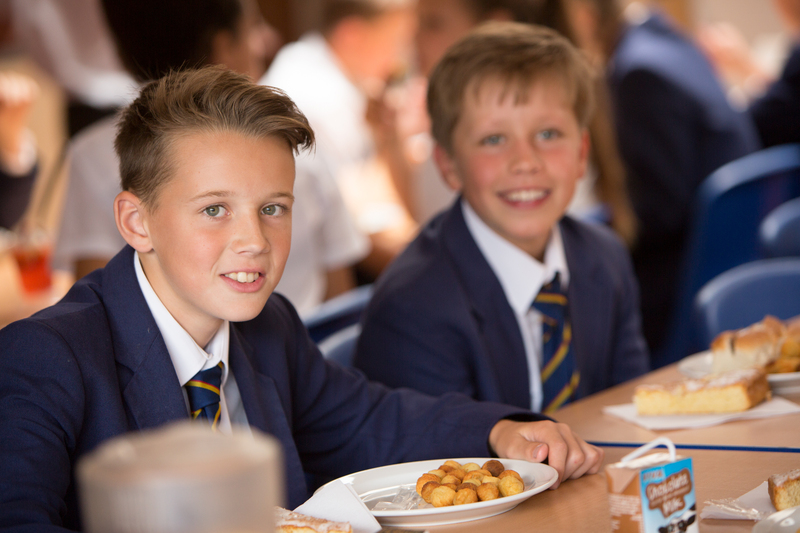 The Junior Dining Room gives pupils and students the ideal opportunity to meet with their friends before school and enjoy a delicious and nutritionally balanced breakfast in a relaxed atmosphere. We are open every morning from 8.00am. Our catering team offers a range of options at break times to encourage healthy eating, providing a wide selection of bread-based snacks including paninis and teacakes, fresh fruit and drinks. In addition to a vast array of freshly made sandwiches and rolls, we also provide two main meal options at lunchtime, one of which is always suitable for a vegetarian diet. Fresh vegetables, rice and pasta, jacket potatoes, hot snacks, homemade soup, a full salad bar and a range of hot and cold deserts are also available. A selection of take-away food is available too. Payment for school meals is either by card or by biometrics. Pupils and students can top up their cards with cheques or cash at the machine on the ground floor by the maths department or by placing their money into an envelope and posting it into the box by the kitchen. Parents can also top up their child's catering account via Parentpay. Please click below for sample menu and price list.